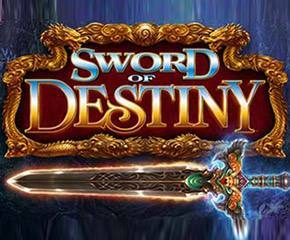 Sword of Destiny is a fantasy-themed slot by Scientific Games in collaboration with Bally Technologies. With some high-quality graphics, adventurous theme and Rock n Roll background music, the developers have ensured that players will love playing this slot. Sword of the Destiny slots comes with four randomly occurring bonus features and free bonus games where you can win up to 10X multiplier and 12 free spins. This jackpot slot runs smoothly on all platforms and devices. With 5 reels and up to 50 paylines, Sword of Destiny slots comes with a different gaming engine ‘X-ZONE’. The play screen is divided in two, reels are set in the lower part and an upper part you will see an evil knight helping you to save the crown. All the symbols are related to the theme, you will see an armoured lady, a swordman, a sword woman, gloves, scrolls, flasks, castles and necklaces. The highest paying symbols are armour lady, a swordman and sword woman which gives 200 coins for a 5 symbol win. The game logo depicts the wild symbol which can replace all other icons on the reels except bonus and scatter symbols. Random wilds: During this bonus feature, 4 to 9 wild symbols are thrown into random positions to ensure some guaranteed wins. Upgraded symbols: In this bonus feature, any of the two low paying symbols are upgraded to high paying symbols to increase the winning amount. Extra wilds: 4 to 10 adjacent positions are covered with wilds. Clumped wilds: Up to 3 reels turn totally wild. Like all other slot machines, this slot also gives up to 8 free spins with up to 10x multiplier when two or more X-ZONE bonus lands on the reels. During these spins keep an eye on X-ZONE icon because it will give you an extra spin every time it lands. When X-ZONE bonus symbol lands on 1, 3 and 5 during a single spin, you have to climb a tower to win the jackpot of 500x of your bet amount. You can check your progress by picking stones lying on the way. 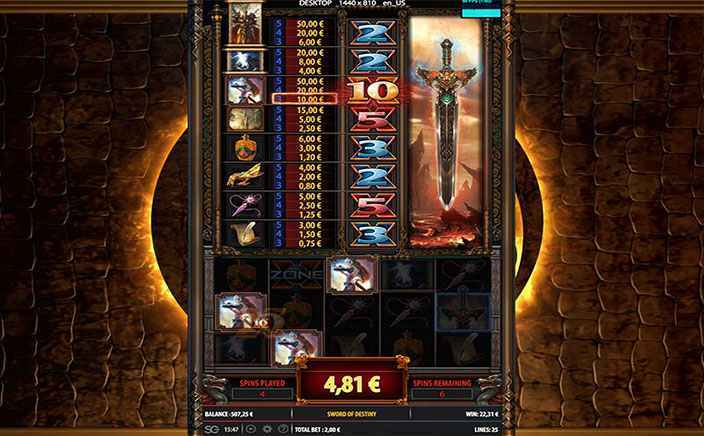 If you are looking for a slot with an adventure theme and lots of extra features, Sword of Destiny slots is for you.